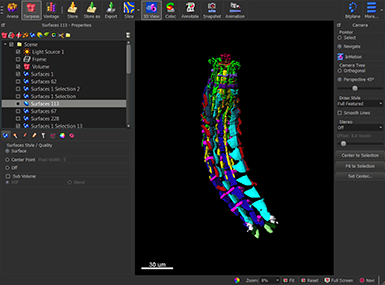 The Arena is an easy-to-use image management system for analysis of high volume data. The Arena is your working centre in Imaris and an interface for visualizing, processing, analysing and interpreting all your images. This is where you add images and creation parameters, create and execute batch runs, and configure all your statistical data-visualization settings. The Arena view consists of a number of elements. On the top your screen you have a convenient access to major Imaris views Arena , Surpass , and Vantage and also all Arena items: Assay , Group , Image , Creation , Collection and Plot . On the left hand side of Arena view you can see Arena tree. The tree is used to organize all the items within the Arena in a hierarchical structure and to provide an overview of the data base organization. It also allows navigation within the Arena structure. 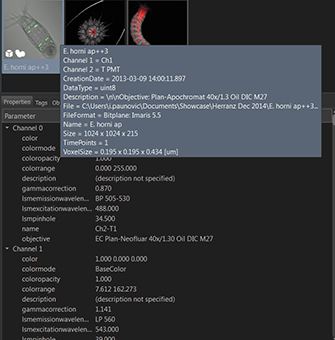 Clicking on the tree element displays the contents and shows all applicable items within. The biggest part of the Arena view display contents of the current tree location or any search results. You can start customizing your Arena view by adding top level Arena item, Assay. Assay should be used to handle a large data set of similar data. It may contain a large amount of experimental image data and any associated information. To create an Assay, select the Add Assay icon . Enter a descriptive name and a new item, Assay, is created and added to the Arena. 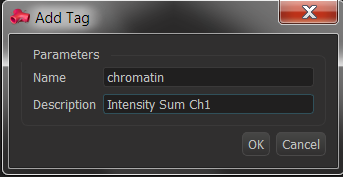 To add images within the Assay, select the add Image icon . 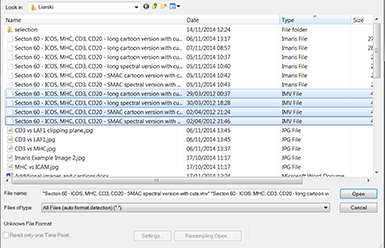 The Open File window appears and you can select all required images. 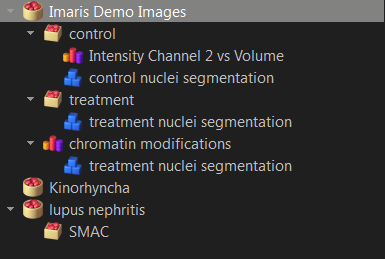 Imaris automatically detect all data types and import them with in the Arena view. In the Arena view, the following icon indicates that the image is loading . 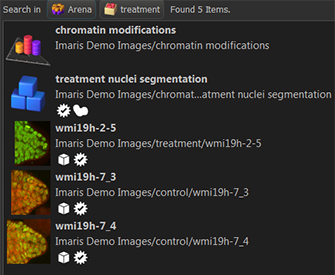 Once Imaris has finished adding the files, the image’s thumbnail appears within the Arena view. A small icon in the bottom left corner of the image thumbnails indicates the image type and/or any created objects. Please note that files are not moved to the database but just links to the files are created. To further arrange your Arena view, you can organize the images in sub groups. To create a Group, select the add Group icon . Enter a descriptive name and a new item, Group, is created and inserted within the currently active Assay. Select the image you would like to copy/move and by then simply drag and drop the images into the newly created Group. The Group icon is updated, indicating the added content . Double click on the image thumbnail to open it in the Surpass view. 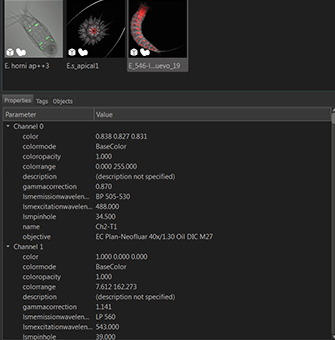 Within the Surpass view you can complete an appropriate Creation Wizard: Cells, Filament, Spots and Surfaces, and create the required objects. Before switching back to the Arena, the created objects could be stored. There are several options available: Store , Store as and Export . The Store option saves changed data set into the data base within the selected Arena Group. The icon overlaying the image is updated to reflect the newly created Surpass object(s) . The Store as option stores the changes made to the image in a different file whilst maintaining the original file unchanged. Select this option, modify the name of the image and a new image item within the Arena view is created. Finally clicking on the image thumbnail Detail area is displayed. Detail area has three tabs: Properties, Tags and Objects. 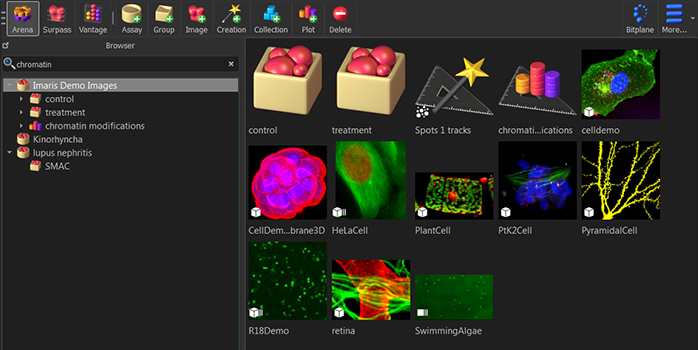 The Properties tab contains all image-related acquisition metadata stored at the original file format. The summary of this information is also displayed in an overlaid window when you hover over thumbnail. The Object tab lists all manually created and stored object types. 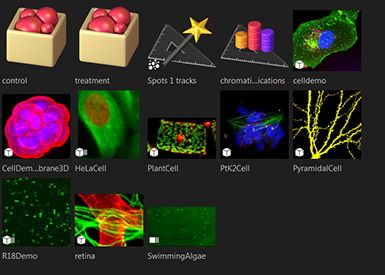 To assist you in finding and organizing the created objects, each one is labeled with an object icon and name. The Tags tab allows further information to be entered about the selected item(s). Text and description entered in the tag fields are searchable and may be used to store information about the used creation parameters, the type of the Vantage plots or any other additional information. The search field allows efficient interactive exploration of items to find a specific item and rapid scanning of item tags.